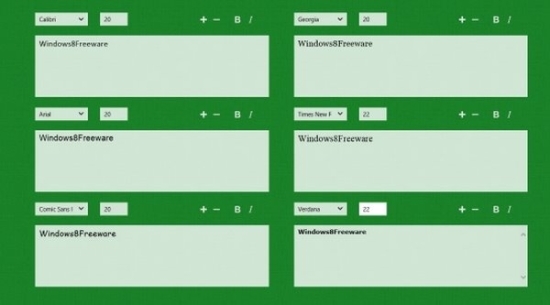 Here is a list of 3 free Windows 8 Font Viewer apps. You can use these apps to see and compare various fonts on one screen. Generally, when we work on a document or make a report on Microsoft Word, we manually select a font and see if it suits our document. Sometimes it gets so irritating to keep changing fonts in order to find the best suited one for our document. In such a case, you can use these Font Viewer apps. 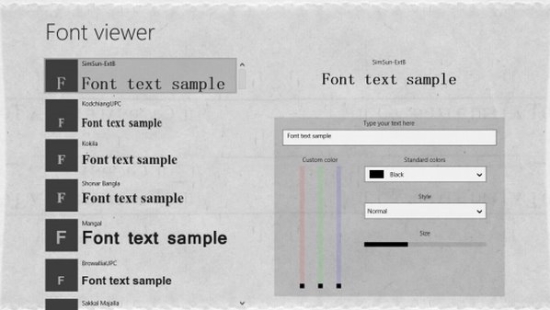 These apps let you quickly see and compare different fonts by entering a sample text. They also have various text formatting options that might be useful while deciding on the highlighted text on a document. Let’s have a detailed look at each of these Font Viewer apps. FontFamily is a free Windows 8 Font Viewer app that lets you view and compare up to six different fonts at one time. It is a single screen app with an easy to use interface. The app also supports various text formatting options such as Bold, Italics, and Increase/ Decrease Font Size. The main screen of the app displays six different text boxes. You can select a different font style for each text box using the dropdowns provided in the app. You can also type a different font size for each text box. As you enter text in one text box, it gets automatically copied to the other text boxes and you can easily view and compare it with the defined formatting options. However, the only limitation of the app is that you can compare only six fonts at a time. Click here to get FontFamily. Font Viewer is a another free Windows 8 Font Viewer app that helps in viewing and comparing all the listed fonts on your system on a single screen. In this app, you can preview a text in all the fonts installed on your system in one time. Thus, this app displays preview of a much larger number of fonts in one go. Font Viewer is an advanced Font Viewer app with many more interesting options to explore. You can select font color, adjust font size, and compare different fonts. In fact, you can customize color of the font with the color sliders provided in the app. The interface of the app might not look attractive but its functionality quotient is high enough to make it your choice of app. Click here to get Font Viewer. Font Previewer is a free Windows 8 Font Viewer app that lets you see a preview of multiple selected fonts together on one screen. The app detects all the installed fonts on your system and lists them on the app’s screen. You can mark multiple fonts out of the listed fonts to view and compare them. However, if haven’t selected any fonts, the app will display a preview of all the listed fonts. Along with text formatting options like changing font size, making the text bold or italics, this app also gives you freedom to customize the font color using the color sliders. So, you can use these options to optimize your search till you find the best font for your text. Click here to get Font Previewer. These were some of the useful Font Viewer apps we have found. Try and use these apps to get the most suited and desirable font for your document. Share your feedback via comments.